When I am alone, I tend to try new recipes, practice makes perfect. Plus I have learnt that cheese on crackers does not a dinner make. By practicing, I make my dinners more exciting. 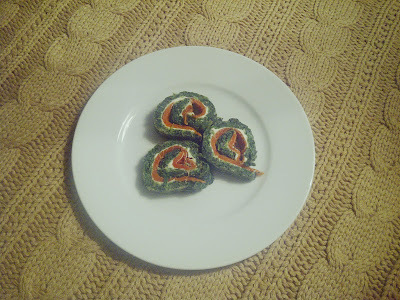 You know by now that I am the healthy type, and I am lucky enough to have tons of light family recipes, so here is a Spinach and Salmon Roule. Light, tasty, and colourful, just what I like!